The Motorola ATRIX 4G captured most of the buzz among smartphones during the 2011 CES in Las Vegas. In fact, the device was named "Best in show" in the smartphone category and AT&T bills it as "the world's most powerful smartphone". Now, it is time for Motorola and AT&T to turn the buzz into bucks as pre-ordering has begun. After a rebate and a signed 2-year contract, the phone will cost $199.99. After viewing videos of the docks that the ATRIX 4G can connect with, you might want to consider a package deal consisting of the Motorola ATRIX 4G and the laptop dock for $499.99 which is after a $100 mail-in rebate and a signed pact. Without the phone, the laptop dock is priced at $499.99. so if you are even considering it, buying the phone together with that dock is obviously the best way to go. Motorola is also offering an Entertainment Access kit for $199.99 which includes a HD Multimedia dock, Bluetooth keyboard and a mouse. The carrier is not offering a bundled plan with the Entertainment kit. 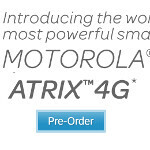 And to pre-order the ATRIX 4G, your AT&T plan must cost you a minimum of $15 per month for data. Just tried to order on ATT website, but no mention of the $499 bundle. If you scroll down on the pre-order page with all the different plans it's on the bottom under the accessories. The laptop itself only costs $300 in the bundle which is where people might get confused. I'm trying to upgrade a 2nd Line and other than data/messaging/insurance, Accessories are not listed. Nor are they listed when I shop for accessories on ATT. If I try to sign up as a new customer, I see the accessories and Bundles as you mentioned. By the way, I was able to order the Atrix and keep an unlimited data plan as talked about on here earlier. How much is the unlimited data at att? Thought they only have the 15 and 25 plans. I looked today and saw the 45 dollars for 4gb what I haven't seen before... It's interesting because verizon has 29 for unlimited..... my contract is about to expire and was thinking about the inspire but can't stand its design so the next would be the atrix which looks great and had awesome specs but the cost of the data plan looks better on verizon. not to mention that w/ a new acct. almost any phone is free. Am i missing some hidden fees, tricks ?